That should be enough to handle all the EVs we’re gonna drive. If Grand View Research is correct, then electric vehicle fans have nothing to worry about. That’s because one of the backbones of the EV industry – the global charging infrastructure market – is going to grow exponentially from its size in 2016 ($1.16 billion) to over $45.59 billion by 2025. In fact, Grand View Research (GVR) says that there will soon be, “aggressive growth of EV charging infrastructure.” We’re not going to need that many more EVSE units if the cars aren’t going to be purchased and driven, right? One of the aspect that GVR focuses on in the new report – officially titled “Electric Vehicle (EV) Charging Infrastructure Market Analysis By Charger Type (Slow Charger, Fast Charger), By Connector (CHAdeMO, Combined Charging System), By Application, By Region, And Segment Forecasts, 2014 – 2025” – is how many DC fast chargers it expects will be installed in the coming years. Unsurprisingly, GVR things that the SAE Combo (CCS) system will overtake the current DC Fast Charging leader, CHAdeMO, at some point in the near future. To get the details of when this will happen, we’d have to pony up thousands of dollars for the full report, but the graphic above makes it look like it’ll happen some time after 2025 in the U.S. The GVR report also looks at AC fast charging, which is something we don’t hear too much about. These chargers are capable of outputs of up to 43kW, so they can’t quite touch the 300kW speeds of some of the more powerful DC fast chargers. As you can probably guess, GVR expects governments and the automakers themselves (think Tesla) to lead the charge for more public EV chargers. For a random comparison, GVR also released a report today that says that the “Microwave Devices Market” will reach $11.86 billion in 2024. The more you know. 18 Comments on "Study: EV Charging Infrastructure Market Will Be Worth $46 Billion In 2025"
Excellent news, but most of us EV folks pretty much expected the expanse of the charging infrastructure. Great investment opportunities for all those that aren’t seniors. So… is the big money in installing them? or owning them and selling amps? In Florida, you can’t sell amps unless you’re an utility. Tesla should begin selling fast chargers to private entities. What is most ridiculous is that the big electrical utilities haven’t really seized this opportunity yet to install chargers everywhere in their territories so they can sell their own product ELECTRICITY! Shows what fools most of them are as they are busy fighting against rooftop solar and distributed grids. It’s because the leadership is all Republican global warming deniers. How is that relevant? These are supposed to be business orientated people so they should not care which cause they help as long as there is dough in it for them. Correctomundo…the dough is perceived to be in fossil fuels because global warming is a fraud to the deniers. When the same men are both the dominant business owners and the arbiters of the social system, you see weird actions. They see both of these interests as tied together, but must never say that in public. They may disagree with each other over whether their dominance over society is the source of their wealth and must be prioritized, or the opposite. For instance, think of the slaveowners of the Old South, their staggering investment in their crime, and their need to manipulate Southern culture to become increasingly irrational to support their institution. Was this an economically rational act? Was it just their need to be at the top of the pyramid at all costs? From the slaveowners point of view it was a rational act to maintain their wealth, because slaves were valuable property with VERY little maintenance cost. It was so valuable that the slaveowners chose war and the destruction of the South over relinquishing their immoral wealth. The interesting part is that it continues today in the form of “law and order” agendas by the Republican party. You could have chargers at curb where ONLY EVs can park. If you park there without an EV it is a huge fine. I think the Chademo value is completely wrong. 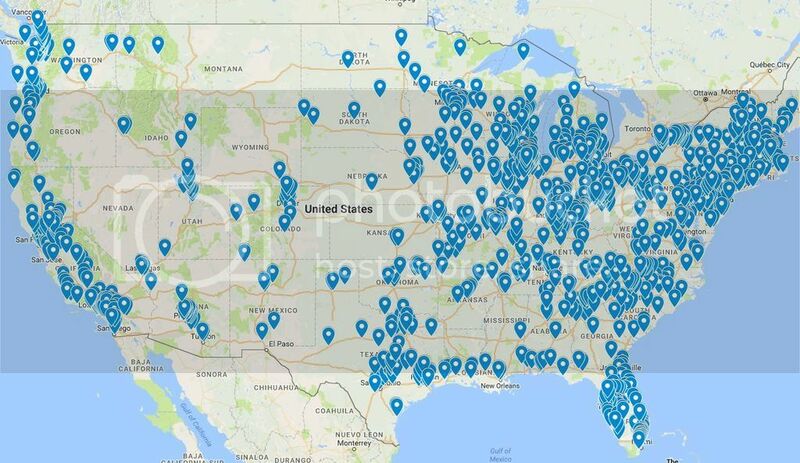 There are almost twelve hundred Bolt EV dealerships with CCS chargers represented on this map. The current number of CCS charging stations are going to more than double by the end of the year as these Bolt EV CCS chargers come on line. Many people complain because they think Chevrolet isn’t supporting EV charging infrastructure for the Bolt EV, with the Bolt EV dealership CCS charging network GM is providing a whole new charging infrastructure in its’ own right. I think GM is stepping up in a big way to provide CCS charging infrastructure for the Bolt EV. GM added twelve hundred DC fast charging stations for only about $170,000,000. It makes me wonder how much charging infrastructure the Dieselgate $2,000,000,000 will buy. I hate Photobucket!! Moderators, can you get the picture to show up instead of the link? Are they available 24/7? Probably not. In 18 states car dealers are closed on Sunday. Not all that conveniently located either. Still if you own a home you can charge there. Also only dealers that sell Bolts need to install them & they are only required to install one. What are the chances that that one will be in use? All correct but if you are 200+ miles from the nearest commercial CCS charging station a dealership CCS charger would come in pretty handy. I never made any recommendation to use dealership chargers instead of home chargers. Since Bolt EVs are still extremely rare, the chance of the dealership CCS charger being used isn’t very likely but as the population of Bolt EVs increases I would expect commercial charging stations to start sprouting up. Let’s try this map again.